Presentation folders, also known as Kit Folders, are perfect for presenting documents in a professional and organized way. 12pt C2S is Gloss Coated on both sides. 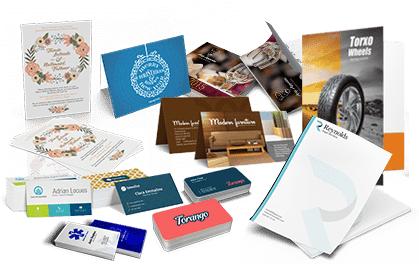 This is slightly lighter than the average business card and is a more economical option for postcards or leaflets. 10pt C1S is Gloss Coated on 1 side and uncoated on the other for items that will need to be written on, like Postcards or Greeting Cards. This is the lightest and most economical card stock that is offered. 10pt C2S is Gloss Coated on both sides and can be used as an economical card stock option for postcards and doorhangers. This is a semi-rigid card stock ideal for any item that requires more structure and comes gloss coated on both sides, however additional coatings can be added. Because of its thickness, it is not ideal for folding unless scored first. This is an ideal stock for postcards, door hangers, and presentation folders. A standard sized kitfolder with one 4" pocket on the left side of the folder when complete. With no business slits on the pocket, additional content or logos can be included in this area. A standard sized kitfolder with one 4" pocket on the left side of the folder when complete. With business slits on the pocket, additional content or logos could also be included in this area, as long as care is taken to ensure that nothing gets cut or covered when it should not. A standard sized kitfolder with one 4" pocket on the right side of the folder when complete. With no business slits on the pocket, additional content or logos can be included in this area. A standard sized kitfolder with one 4" pocket on the right side of the folder when complete. With business slits on the pocket, additional content or logos could also be included in this area, as long as care is taken to ensure that nothing gets cut or covered when it should not. A standard sized kitfolder with two 4" pockets on both sides of the folder when complete. With business slits on both pockets, additional content or logos could be included on both pockets as long as care is taken to ensure that nothing gets cut or covered when it should not. A standard sized kitfolder with two 4" pockets on both sides of the folder when complete. With business slits on the left pocket, additional content or logos could be included on the left pocket as long as care is taken to ensure that nothing gets cut or covered when it should not. Content on the right pocket does not have the same restrictions. A standard sized kitfolder with two 4" pockets on both sides of the folder when complete. With business slits on the right pocket, additional content or logos could be included on the right pocket as long as care is taken to ensure that nothing gets cut or covered when it should not. Content on the left pocket does not have the same restrictions. A standard sized kitfolder with two 4" pockets on both sides of the folder when complete. With no business slits on the pockets, additional content or logos can be included in this area. AQ is short for Aqueous Coating. This is a semi-gloss, environmentally friendly, water-based coating that provides additional gloss and protection, and can be written on with a ballpoint pen. It can be applied to one or both sides of the printed piece. AQ is short for Aqueous Coating. This is a matte, environmentally friendly, water-based coating that provides additional protection with a softer finish, and can be written on with a ballpoint pen. It can be applied to one or both sides of the printed piece. Presentation Folders help you keep your materials professionally organized and packaged. You can use them in one-on-one meetings or with large groups to ensure consistent branding. They make it easy for your recipients to keep all of the material you provide together in an easily transportable and organized way. 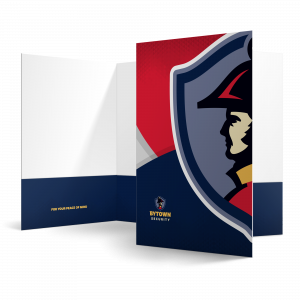 Custom Folders also offer you a nice sized canvas to emphasize your brand or reinforce your message. Optional business card slits ensure your contact information is always included. The most common order option is our 9x12 folders finished (folded) with two pockets and a business card slit on the right pocket. They are most often printed on 14 Pt. Gloss Cover stock in full color on 1 side (4/0) and are coated AQ 2 Sides. This creates full color on the outside front and back of the finished folder with coating on both the outside and inside. 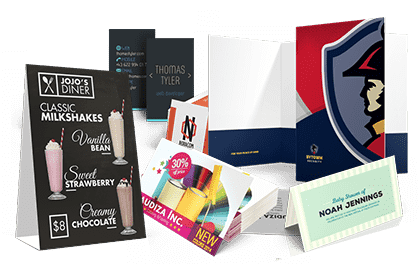 Presentation Folders help you professionally organize and package your printed materials. You can use them in one-on-one meetings or with large groups to ensure consistent organization. 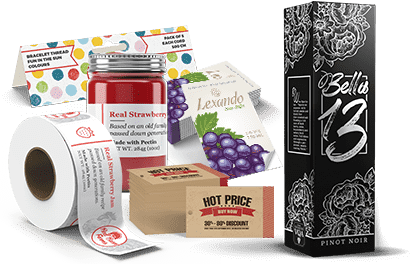 They make it easy for your recipients to keep all of the material you provide together in an easily transportable and organized way. Custom Folders also offer you a nice sized canvas to emphasize your brand or reinforce your message. 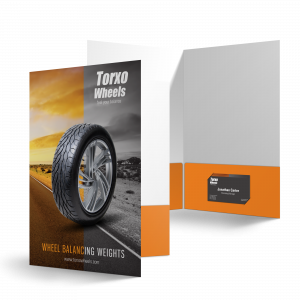 Presentation Folders work for a wide range of uses from seminars to sales kits. Don't plan a meeting or give someone several pieces of printing without Presentation Folders.